The George | Pub Quizzers | Find a pub quiz near you, now. 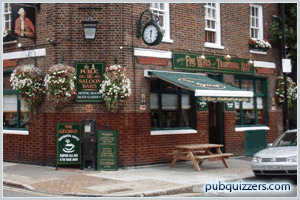 Pub quizzes take place at The George, Crossharbour on Sundays (weekly) at 19:30. Entry is £2.00, you can have up to 10 people on a team. There are prizes of cash, spot prizes. Happy quizzing! The George is currently taking a break from quizzing, but you can enjoy the popular classic quiz fun at the Ship Inn on Sundays at 7:30pm (290 WESTFERRY ROAD | E14 3AG) or the Cutty Sark in Greenwich on a Wednesday at 8pm (4-6 BALLAST QUAY | SE10 9PD ) or The Grapes in Limehouse on a Monday at 8pm (76 NARROW STREET | E14 8BP). There's lots of other ideas by clicking on the web link on this page.